The audio gear we listen to music on has changed radically over the decades. The audio gear we perform music on, not as much. Only a few traditionalist audiophiles still want the kinds of stereo systems commonly in use when Getz/Gilberto debuted in 1964, but most guitar players would be thrilled to own a Fender or Marshall amp from that same era. Recently, though, guitar amps have started incorporating a modern feature that musicians of all types should welcome. It’s Bluetooth wireless—a smartphone-focused technology that may change the way we think about instrument amps. Bluetooth allows transmission of audio signals over short distances, usually 15 to 30 feet max. It’s built into every smartphone and tablet as well as into many laptop computers. Bluetooth has already revolutionized car, home and portable audio systems, making it possible to stream music, podcasts, Internet radio, phone calls and audio from YouTube videos into speakers or headphones. One might expect Bluetooth to be used for wireless connections between guitars and amps, but because standard Bluetooth has a lag (or latency) of about 1/6 of a second, it’s impractical for that function. But when it comes to streaming music from a phone into an amp, Bluetooth’s latency is no problem because the guitarist is playing along with the Bluetooth signal instead of through it. Many guitar amps now include a wired input for a smartphone or tablet, so Bluetooth doesn’t necessarily add new capabilities; it just makes things more convenient. Extra cables are never welcome—especially on a bandstand, where an accidental disconnection can ruin a performance, and where a performer may already be running a half-dozen cables between the guitar, the stomp boxes and the amp. Used within its range, Bluetooth forms a robust, reliable connection, and in most cases it connects automatically once a phone and a Bluetooth-equipped amp are initially paired. Beginners and pros alike benefit from the convenience of Bluetooth. Obvious applications include playing along with tunes stored on a phone, streaming music through the amp during set breaks and even using the amp as a home audio system. In amps such as those in Fender’s new Mustang GT series ($299 – $599), Bluetooth can allow the smartphone or tablet to control an amp’s advanced features, such as selecting different digital amp models and adjusting built-in effects. For jazz guitarists, the best use for Bluetooth is probably playing along with iReal Pro, an app that provides lead sheets for more than 5,000 tunes, including most jazz standards. Many other apps also benefit from Bluetooth. For example, I use DronePhones Lite as a pitch reference when I practice scales on my double bass, and I use DMach to create drumbeats to inspire my compositions. With Bluetooth, I can set my phone where it’s easy to reach, right on my music stand, without worrying that it will be suddenly yanked off the stand if I trip on a wire. When trying out a couple of Bluetooth-equipped amps, I was reminded that the requirements of a good guitar amp are very different from the requirements of a good music system. Most guitar amps have relatively large speakers that are poor at reproducing treble—something that matters little when you’re using the rhythm pickup of a Gibson ES-175, but becomes glaringly obvious when you hear Elvin Jones’ cymbals and snare through the amp. For practicing, this doesn’t matter so much, but it’s a problem if you want your Bluetooth-equipped amp to double as a home stereo system. 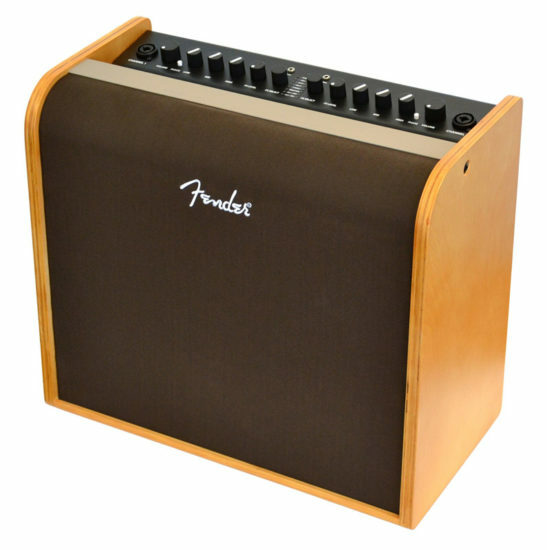 One amp that does a nice job for both applications is the Fender Acoustic 200 ($549). Because it’s designed for use with acoustic guitars and vocals, it produces a fuller range of sound than most guitar amps, so it sounded pretty good when I streamed a couple of Stanley Turrentine tunes from my phone. It also played incredibly loud. By my measurements, it maxes out at 108 dB, about 20 dB louder than most of the portable Bluetooth speakers I’ve tested. Small amps that are closer to the form factor of portable Bluetooth speakers, such as the $249 IK Multimedia iLoud and the $89 Blackstar Fly 3 Blue, will also tend to sound better with music, although for guitar-related purposes they won’t be loud enough for anything more than practice. Amps optimized for guitar sound, such as Marshall’s $249 Code 50, tend to make music sound dull—but, of course, they’ll do much better at delivering classic guitar tones. Any amp can be made Bluetooth-ready with the Blackstar Tone:Link adapter, which adds the wireless technology via a 1/8-inch line input. At just $29, the Tone:Link proves that Bluetooth is an inexpensive feature for manufacturers, so expect it to become a much more common selling point in next year’s models. Read Brent Butterworth’s column on Bluetooth for serious jazz listeners.